For my final, I wanted to work more with video and really try and hone my video production skills. I’m already familiar with Adobe After Effects, but my Premiere skills are lacking. I also focused on really using what I’ve learned in my Concepts of Visual Literacy class and merge them with the technical skills acquired during our Media Arts course. I attempted to build suspense, using a few quicker cuts, extreme close ups and a heavier, anxious soundtrack. The POV shots are used to help the viewer feel attached to the scene, and hopefully feel some tension and anticipation. As I reach for this new, mysterious weapon, the audience is hopefully asking, “what’s he going to do with that? ?” Of course, we find out I only wanted a closer shave! Production for this was difficult (shooting oneself is always a challenge—sorry Teresa!) and editing took several days, as the saber effects are a frame by frame process. It was tedious, but rewarding. I learned just how difficult it is to keep continuity when cutting these scenes together, but I think I did a quality job (for the most part, I had some issues in the first 15 seconds or so). I’m looking forward to video production next term! This entry was posted in P6 Final Project on December 4, 2014 by ejiggle. On Thursday, November 13th, at Lane CC, I attended a lecture by Erik Bishoff, a professional photographer residing in here in Eugene. As a former architect, Bishoff has a particular affinity for architectural photography (although he specializes in a variety of forms). The main focus of the lecture was Tilt Shift photography, and how using one of these lenses is not only effective but essential for architectural and landscape photography. However, Bishoff started off the lecture by showing us his portfolio and talking about his journey to becoming a professional. Bishoff received his BFA in photography in 2005, and a Masters of Architecture in 2008. After bouncing around and working for multiple firms in his first few years, he decided to turn his passion into a full time gig: his love of photography and his knowledge of and expertise in the field of architecture made it an easy transition. He emphasized, though, that even though he’s able to make a living taking pictures, he’s unable to specialize specifically in architectural photography. The industry is always changing, and clients needs are always evolving. He’s worked with dozens of companies, and even more individuals. He made sure to stress that, if one wants to make it in the industry, you must be versatile. Not only must your skill set match what it is you want to do, but you must expand that to include things such as wedding and portrait photography. In this industry, in this economy, it’s almost impossible to narrow your focus and spend all your time with one format—it’s imperative that you are a jack of all trades if you want to ensure a steady stream of work for yourself. As for the gear itself, he went in depth on the use of tilt shift lenses. He showed multiple examples of how he has personally used and applied the tilt-shift principle in a professional setting. First, its a crucial tool when shooting architecture and landscape photos. The camera is unable to do precisely what our eyes do, so this lens helps by both tilting and shifting up and down to compensate for the angle of the camera and depth of the subject to maintain a realistic perspective. Tilt-shift lenses also have a much wider FOV, so you’re able to capture more of the scene without vignetting and without losing pixel integrity. One intriguing utility was when using the lens to catch multiple shots, stitching them together and creating a panorama shot, whether vertical or horizontal. Bishoff went on to give us a few examples of when he had to use Photoshop to edit photos in a crucial manner. He emphasized that, while it’s imperative that a photographer must master his craft so that you’re always able to capture the best shot possible, one must also be proficient with tools like Photoshop and Lightroom. He showed us a few instances where he had to edit out a vehicle or some other inadvertent item in the frame. It was also interesting to hear that it’s important to have a nice backlog of stock photo shots, in case you’ve got to replace the sky in a particular scene. Some interesting gear he showcased included a bubble level that mounts on top of your camera, helping you to get your camera straight. The CamRanger is a tool used to wirelessly transmit what your camera sees directly to an ipad or HDTV. This can be particularly useful when working with clients on-site. Overall, this was an interesting and informative presentation. Not only did I discover and learn about a some new technology and gear, I also got some insight on what it is to work in the field of photography and media arts. This entry was posted in X4 on November 16, 2014 by ejiggle. For this project, I wanted to do something ambiguous so as to let the viewer interpret the video the way they saw fit—that’s always my goal when creating something. I want the audience to come away thinking about what they just consumed. I especially wanted to emphasize the melancholy in this scene, thus the black and white footage and the mellow audio. I envisioned someone coming home late at night, depressed and turning to the only two things they think they have—bad habits and music. The effects used during the pan across the vinyl records are used to help establish a sense of the passage of time, as if this were taking place over the course of a whole evening. This was my first time using Adobe Premiere, so it was a good learning experience for me. Premiere is not only deeper than the video editing software I’ve used in the past, but also exponentially more complex. Simple things, such as adding a title sequence and inserting the fade effects, were difficult to employ at first. It was gratifying, though, to learn the ins and outs and produce a piece of work, even if it’s only 40 seconds long! 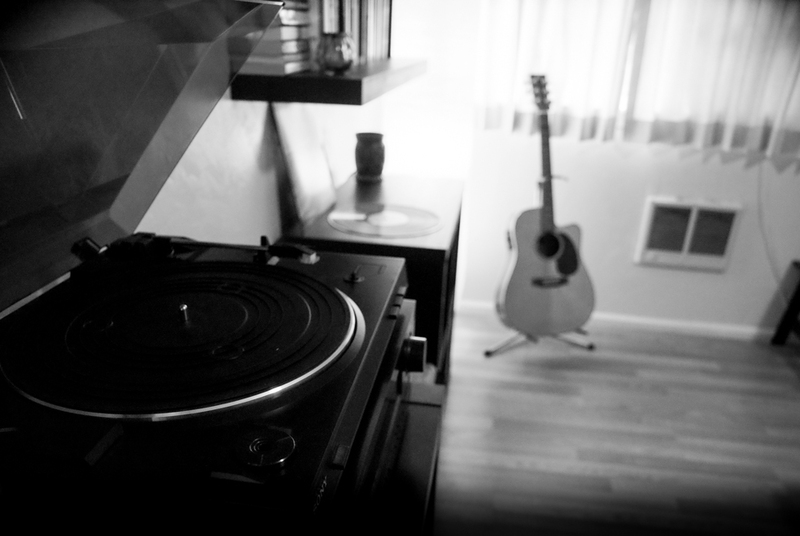 Notice the volume of the stereo and the number of records listened to that evening. Song: What Do You Go Home To? This entry was posted in P5 Image Editing on November 5, 2014 by ejiggle. For this project, I took clips from five different songs and mashed them together into a quick sample. I wanted to make it seem as if someone were trying to tune an old radio and kept coming across a different track from the album. In my mind, this could be used as a commercial, as it displays a few different aspects of the record, and may be used to showcase the music and entice potential listeners. The editing itself was sort of a pain, as I’m used to using programs such as Reaper and ProTools. There was a little bit of a learning curve when it came to shortcuts and where certain features were located, but Audacity is a simple program, I was off and running in no time. The music was written and recorded by a band I joined when I was sixteen, and was released in 2010. 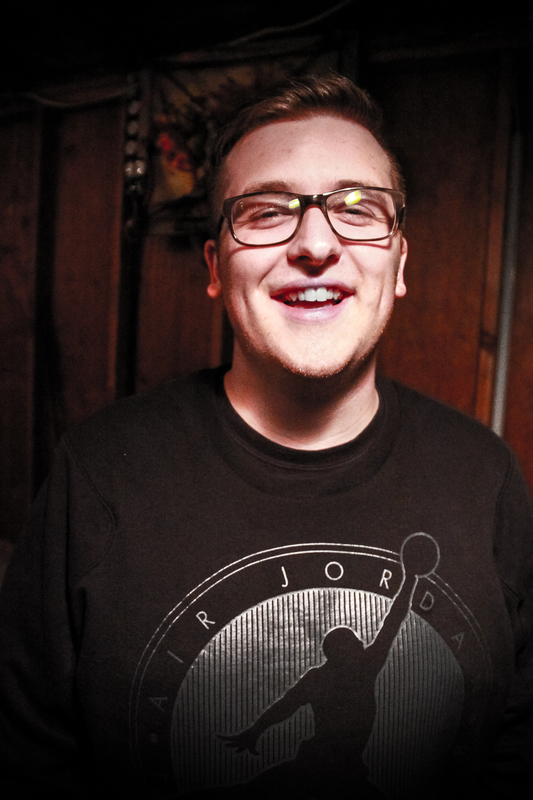 I drummed and did some vocals on the record. This entry was posted in P4 Audio on October 28, 2014 by ejiggle. A few snapshots of my travels around campus. This entry was posted in P1 Scavenger Hunt on October 16, 2014 by ejiggle. 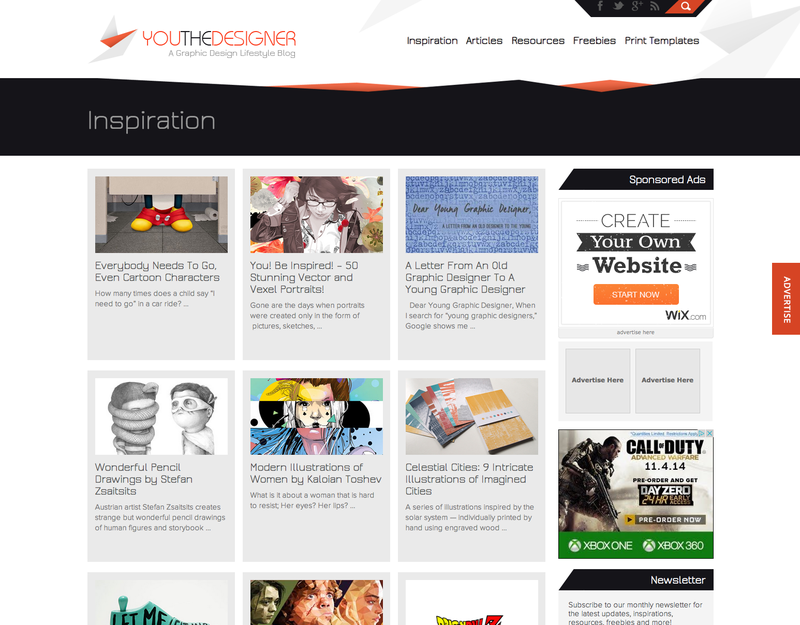 YouTheDesigner is a creative design blog that focuses on the all-encompassing lifestyle of graphic designers. The homepage is inviting, colorful (but not overwhelming) and well organized: right off the bat, I noticed the several different tabs at the top, listing with drop down menus all they have to offer. The site is stuffed with resources, from news articles, artist interviews, tutorials for a multitude of creative programs and of course an artist gallery. Everything is concise and to the point, but there isn’t any shortage of content and information. 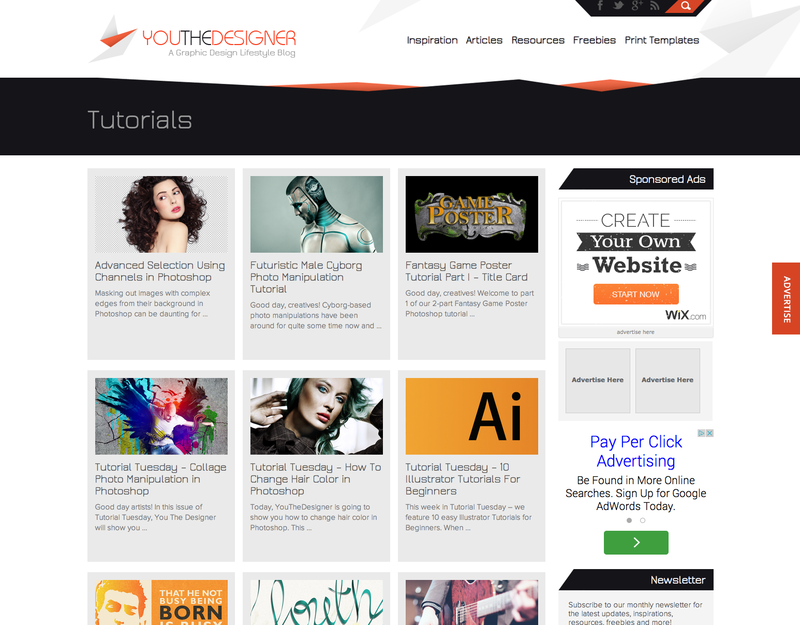 Whether you’re a beginning graphic designer or a seasoned professional, this site is an artists mecca. 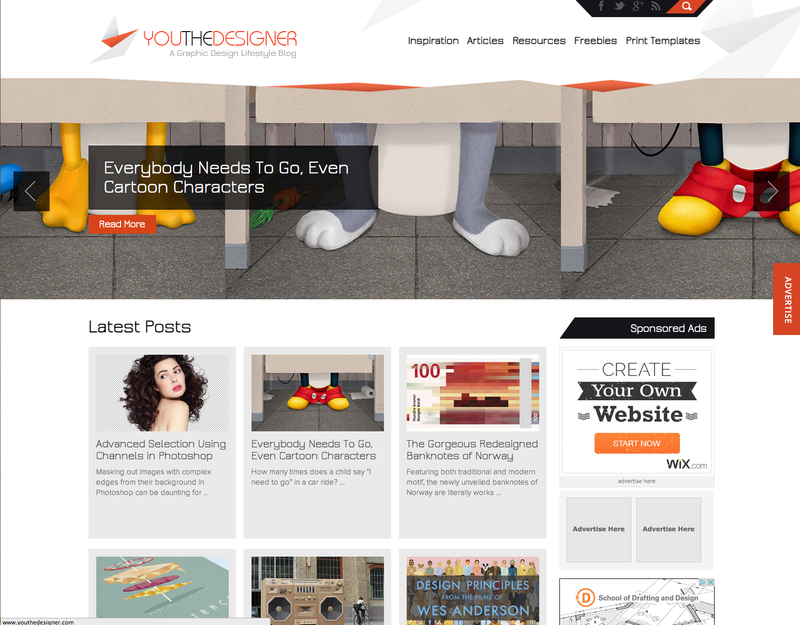 This entry was posted in P2 Professional Blog Search on October 13, 2014 by ejiggle.